A few brave souls ventured down to Boyd Park during a hard spring rain Saturday morning as part of the Amazing Eau Claire Clean-Up. 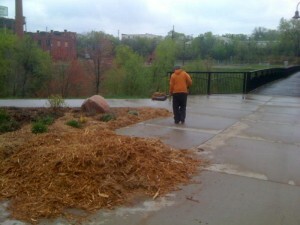 Despite the inclement weather, the dedicated group of volunteers replaced the mulch around the park building and picked up trash along the river from just north of the Boyd Park bridge all the way to Archery Park. Most of the refuse was typical and fairly benign (bottles, cans, styrofoam). However, there were some rather unique items that left the volunteers scratching their heads. One particular item of interest was an old bed spring. I can’t help but marvel at the amount of effort someone expended in order to dispose of a bed spring down the side of a river bank, yet that same person couldn’t find the ambition to look at a calendar for the next bulk pick-up day! There was also an inordinate amount of used pens found along the river. At least the neighborhood litterers are literate! The most curious abandoned item, however, was a single oven mitt in like new condition. If I was the Coen Brothers, I’m sure I could construct a fascinating narrative about such a find. Maybe that’s what someone was attempting to do with all of those pens. Thanks to Mark Wesenberg, Bill Gautsche, Doug Reace, and Jamie Kampf for their help! 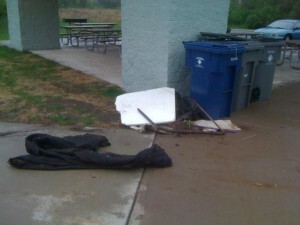 Also, special thanks to the woman who helped clean Archery Park. Sorry, but I didn’t get your name!